Everybody seem to be doing it so ... here I am ... that's me behind the camera. Journal : To photograph truthfully and effectively is to see beneath the surfaces and record the qualities of nature and humanity which live or are latent in all things. Thank you for looking. Thsi is really cool! Love all the extras! Just lov this! Into my fav's. I luv the lo....neat design. Love the color's you choose..nice job! Great layout!! I just love the papers you used here. Gonna have to try this too. Great work. OH WOW!!! 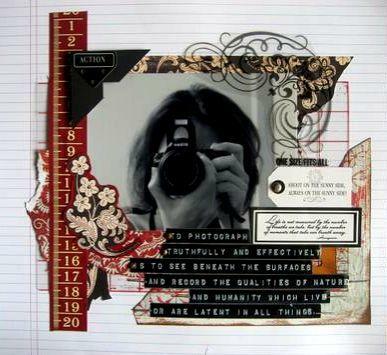 THis is great, I love the colors, I love the way you did the journaling!!! LOVE it! I did not know everyone was doing this! What a great idea, I saw yours first so you get the credit :-) .... I am going to have to lift this idea, fabulous LO! OMG...I love this!!! love the colors and the way you used tape measure, and all your papers look awesome together....love the stamp.....right into favs!!! Awesome!! This is Gorgeous! I love all your details!!! This is a wonderful LO! I love all the pp layering. I lover you whole gallery! I am adding you to my fav artists!